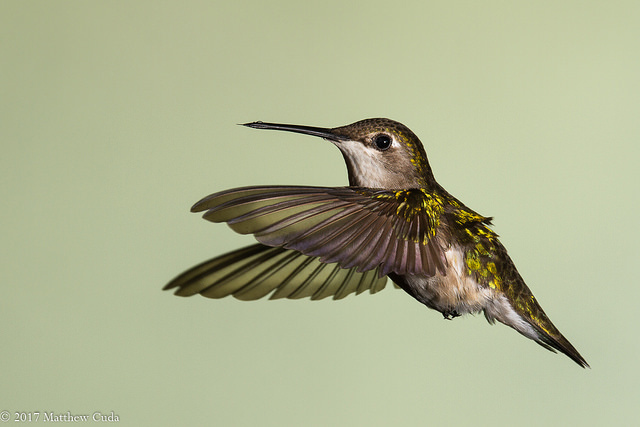 TOBACCOVILLE, NC - As most of you already know, every June for me is the month I photograph hummingbirds. Hummingbirds are without a doubt my favorite "songbird" and perhaps my favorite bird. I tend to flip flop on which bird species is my favorite, but I don't think I would have it any other way. 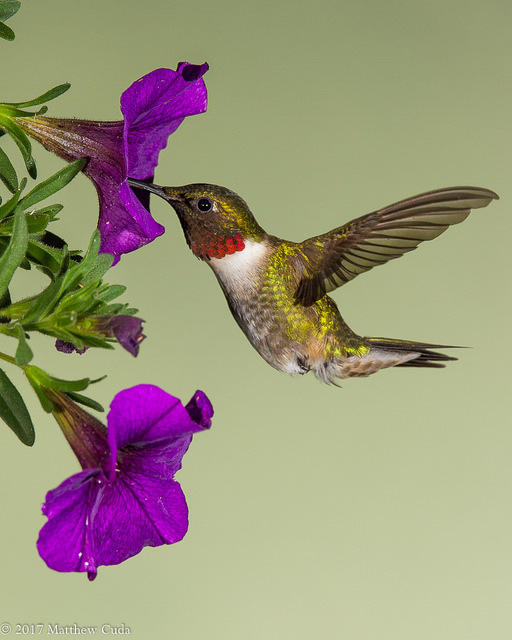 In North Carolina, we only have one species of hummingbird; the ruby-throated hummingbird. I guess if you are only going to have one species of hummer, the ruby-throated is a great one to have. The name comes from the male, who is named for his beautiful iridescent red gorget. As he moves, in relation to the light source, this area reflects back in sparkling red. Each year, I try to add new images using different flowers and different backgrounds from the previous year. This year I hand painted a background to best simulate the foliage in my area, yet give me an uncluttered and smooth look. I also worked with both the petunia and the saliva. I am not entirely sure why, but it appears that the hummingbirds in my area prefer the petunia to the red salvia. Perhaps it is that they actually prefer the bell shaped flowers, but I have not made any definitive conclusions. Forsyth County, NC - A ruby-throated hummingbird positioned in from of red saliva. My setup for photographing hummingbirds remains largely the same as it has been in past years. I use a three flash studio setup. Two flashes are positioned to the right and left of the subject at roughly 45 degree angles and one flash is positioned to illuminate the backdrop. By varying my background flash distance from the background, I can change how dark and how light the background looks. This is one way, you can set the mood of your image. You can also change the background flash position to the right or left so it gives the image a gradient. 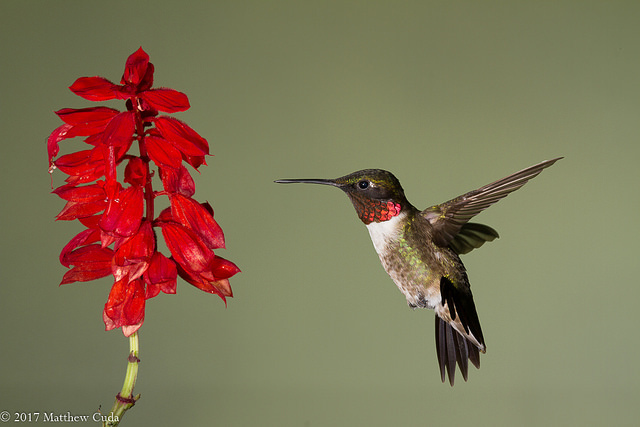 The most important thing to remember when photographing hummingbirds with flash is to control the duration of the flash. I like to have my power set at a maximum of 1/16 power, and most of the time I am in the 1/32 or 1/128 power. This short duration allows me to freeze the wings perfectly. Of course all of this is contingent on what kind of effects you want in your photography. Forsyth County, NC - The female ruby-throated is larger and has a slightly different shape than the male. Both are beautiful creatures. I also spent time this year looking for shots without flowers in them to further isolate the subject and allow the viewer to better see the details in the feathers without the distraction of a competing flower in the shot. The final shot in this newsletter is an example of this type of image. This is just part of my overall style that you see repeated through most of my work. I like to get close and go for impact and detail. In conclusion, I think this June, I was able to capture some compelling images to add to my Hummingbird Project. The main point of this project is to capture the ruby-throated hummingbird under various lighting conditions, backgrounds and angles. Sometimes I try something which fails (you don't see those shots) and other times I hit pay dirt. The point is that i keep going and keep trying something new or something I have never been able to do. I think this is how we grow as nature photographers. I keep uping my game every year, and it is becoming more difficult to top the year before. When we get stagnate is when things get boring and uninteresting. Whether it be in nature photography or just in life in general, what will you do next to up your game? Copyright © 2017 Matt Cuda, All rights reserved.